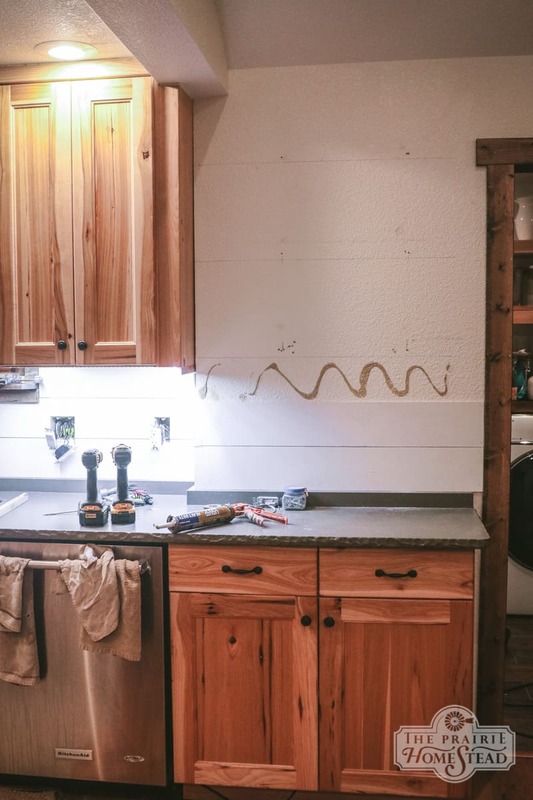 I’m pretty sure I promised the nitty gritty details of my shiplap backsplash to my newsletter peeps about two months ago. In my defense, I had a good reason for the delay… we actually just got the last of the project completed yesterday. Like less than 24 hours ago. Thank you super rainy weather, garden planting, cattle work, and the nightmare of a yard project that just won’t quit. The good news is that the garden is almost completely planted (can I get an amen?!) and the kitchen is finally done (well, minus that missing bit of window trim… sshhhh…). And now onto the other 6 billion summer projects. 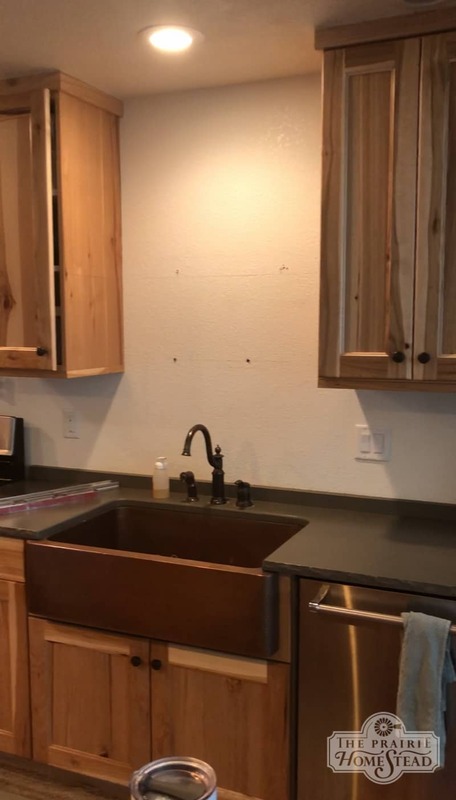 I have another post coming next week with the rest of the gory details of our mini kitchen remodel (like why we cut a gaping hole into a perfectly good wall), but it got too long for one post, so we’ll focus on the shiplap backsplash installation for today. 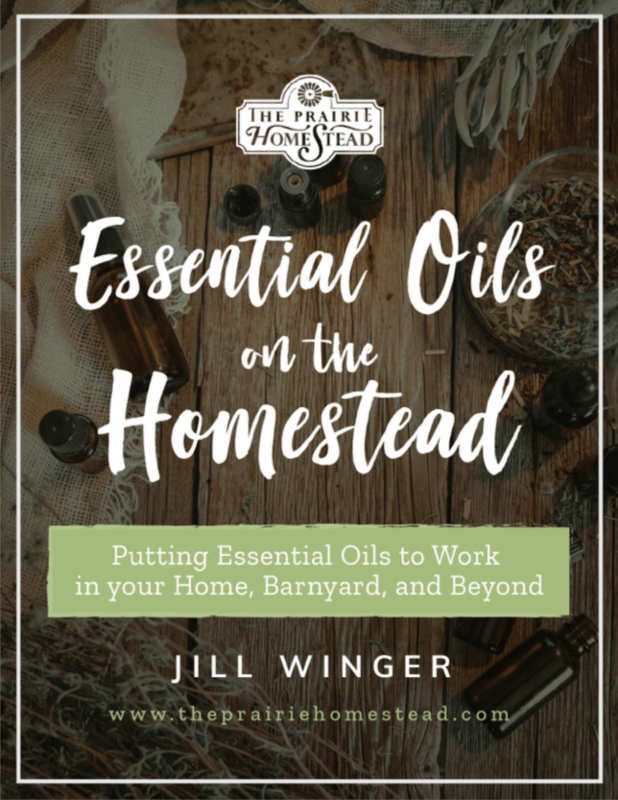 Right about now, some of you are probably thinking, “Uh Jill, didn’t you just finish remodeling your house?” And if you are, you’re correct. 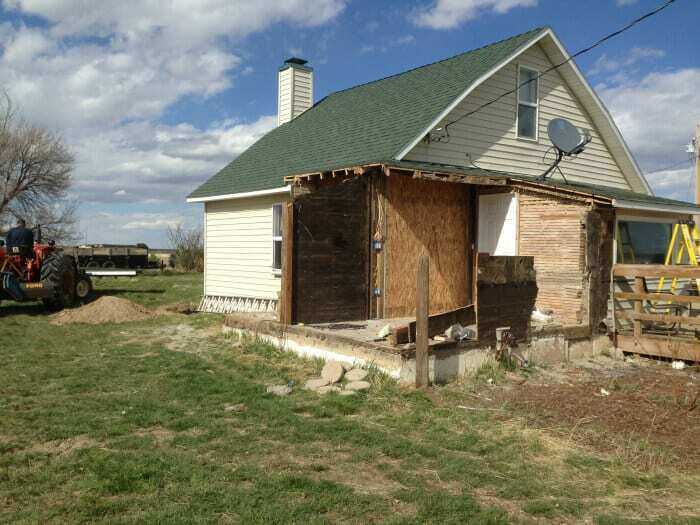 We wrapped up our epic-slash-utterly-insane extreme farmhouse makeover in 2016. We completely redid the kitchen, and other than just a few small things that continually bugged me, like the awkward shelves and range hood (more on that next week), I’ve loved my new kitchen ever since. However, the plain sheetrock backsplash wasn’t working for me. Not at all. 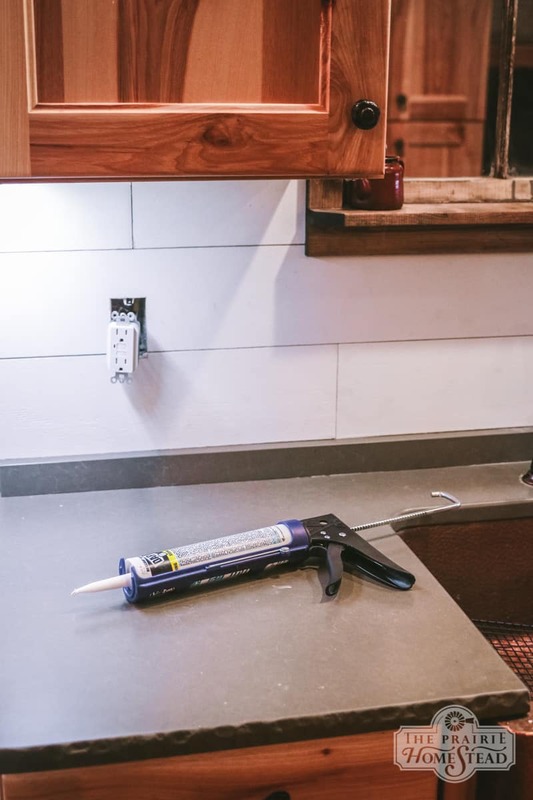 We actually never intended to have sheet rock for a backsplash, but we pretty much fell into a heap of exhaustion at the end of our big remodel in 2016 and didn’t even want to think about doing anything else for a while. I decided to “think” about my backsplash options for a bit and just wait. And then two years flew by and there I was with the same old sheetrock. 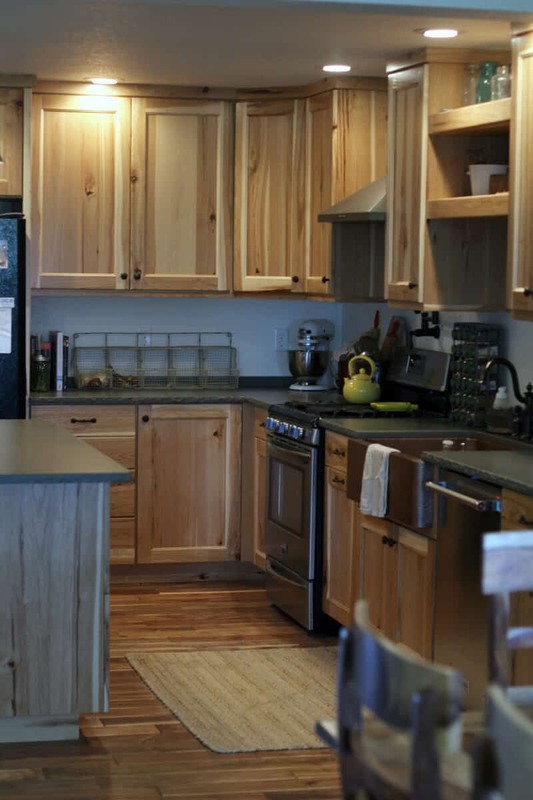 I thought about using weathered wood, but with our floors and hickory cabinets, that would be WAY too much wood. I thought about stamped tin tiles, but they felt they’d be too busy when combined with my cabinets and floors. And that left me with shiplap… the idea of which I fought for months. I know, I know… shiplap is trendy right now and everyone loves it. So what’s my problem? Well, I have an issue with it because it’s trendy and everyone loves it. I liked mason jars waaaay before they were cool. And now that they are everywhere, I almost find them boring. (Sorry, but I had to say it…) Same goes for old chippy furniture and such. 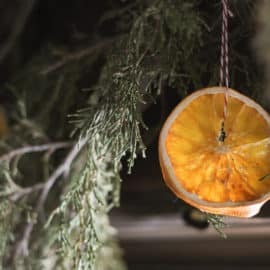 It lost a lot of its charm for me once it started popping up EVERYWHERE. I know, it doesn’t make sense. Everyone else follows trends, I go the opposite… That’s just how I roll. 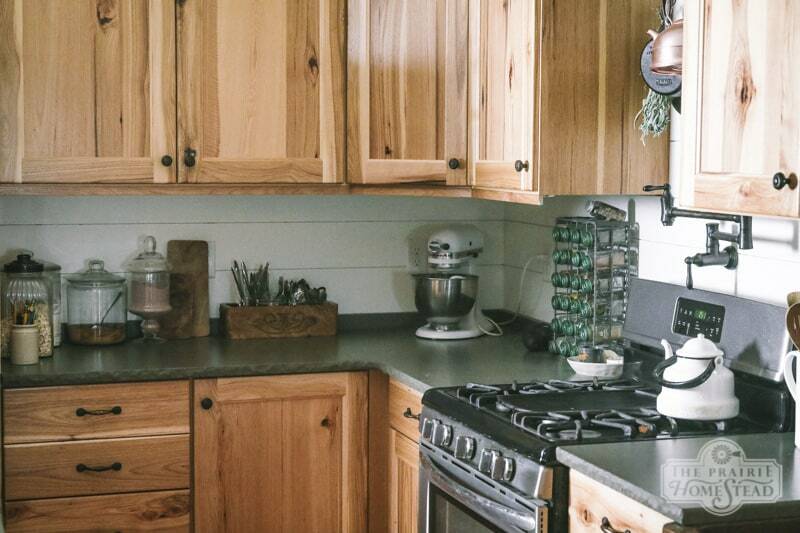 I racked my brain for months trying to think of an option other than shiplap, but I couldn’t come up with anything that would be slightly understated and compliment the rustic hickory cabinets, yet still provide that vintage sort of feel. The tipping point finally came after I remembered our old kitchen had large planks underneath the layers of sheetrock when we demoed it (unfortunately, the planks weren’t salvageable). Therefore, plank walls would technically be original to our house. In a round about way, that made me feel better, because if when shiplap goes out of trend in a few years, I know it’ll still be true to our home, and I’m good with that. 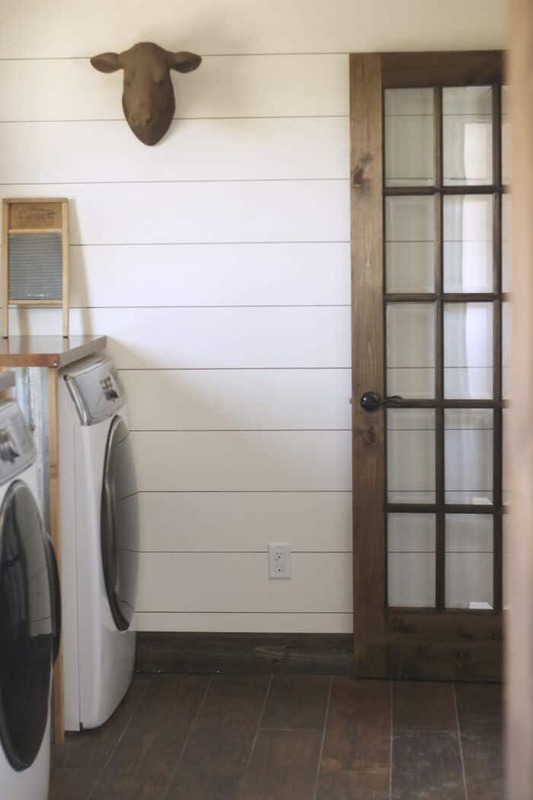 Similar to the shiplap we put in our laundry room that you can see in the photo above (I was OK with it there two years ago because I felt like it would be easier to replace if I ever got tired of it) Christian cut plywood sheets into 6″ planks. And so I found myself sanding them after I painted them. Not ideal, but thankfully it didn’t remove all of the paint. 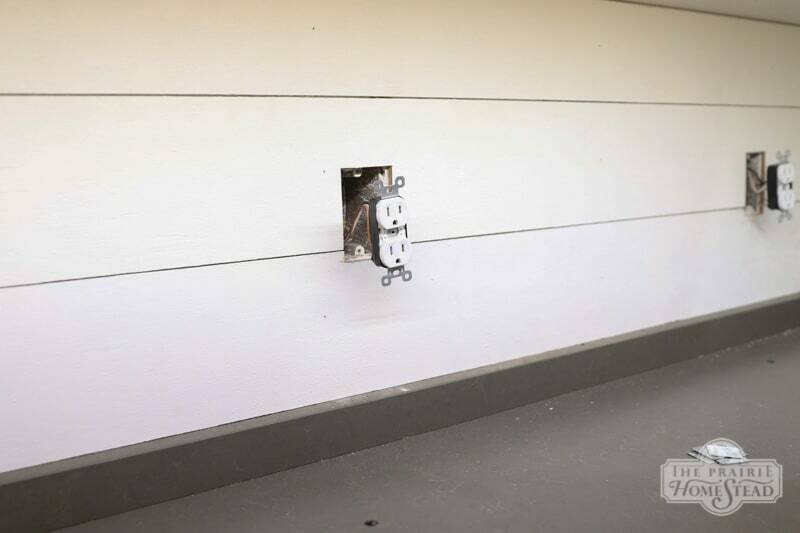 We used a combination of Liquid Nails and a nail gun to affix the shiplap to the wall and then I filled and sanded the nail holes for a slightly smoother looked. I gave the whole thing one more coat of paint to cover up the sanded spots and make sure everything had a smooth finish. Some tutorials recommend filling the gaps between the boards, which we considered, but I’m SO glad I didn’t. The gaps are perfection. I have ZERO regrets that we went with shiplap, and it gives the exact vintage vibe I wanted without being too distracting. It really changes the feel of the whole kitchen. And it really wasn’t all that difficult or expensive to create (although Christian might say differently). As far as wipe-ability with the shiplap, as long as it was sanded (I used 220 grit), it’s much more wipeable than sheetrock. I would highly recommend using semi-gloss paint if you’re installing it in a kitchen. Stay tuned for look at the rest of our mini remodel, including us ditching our range hood and cutting a giant hole above the sink. I know, I know… we’re gluttons for punishment… Or just plain crazy… or something. I’m the same way about home decor trends but your shiplap looks gorgeous in your kitchen. I’d say it was definitely the right choice. I completely agree with you about trends and doing what everybody else is doing. 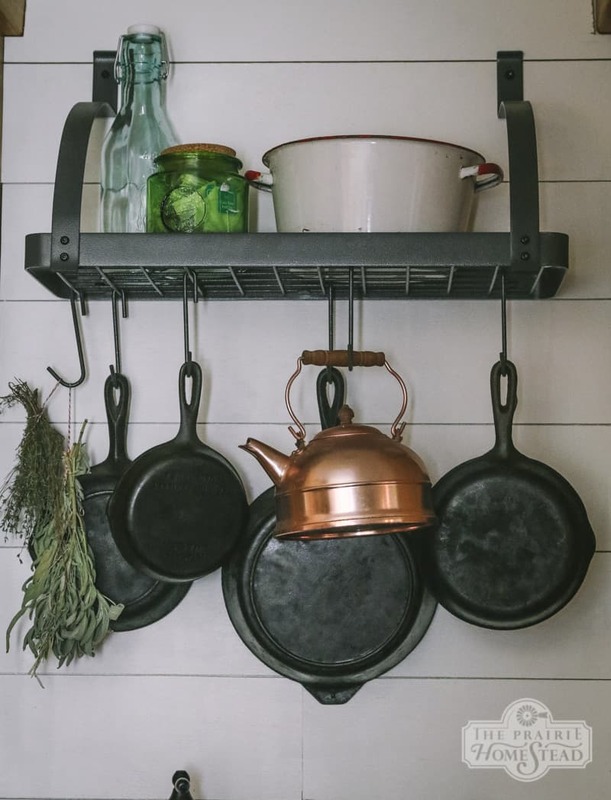 So overrated… I love this setting though because it works perfect with your kitchen. Awesome kitchen too, looks and feels like someone actually cooks there and kudos to getting that garden planted. Have a great weekend! Yup– you and me both, Alana! It’s a window– but it looks into our laundry room. I just published a brand new post with all the details! Can I ask what thickness your plywood was? I absolutely LOVE your kitchen. Beautiful job installing and painting. Your kitchen looks really nice. On treads, I am that way about subway tiles. Every magazine I pick up uses them. I look forward to further posts. Your hard work is paying off. I agree with you on the subway tiles, Mary! I like the look of them, but like you, I see them everywhere and am afraid I’d be tired of them soon! Wow this is the first time I’ve heard someone express my thoughts EXACTLY on both mason jars AND shiplap! It doesn’t help that I live near Waco and almost everywhere are the Chip and Joanna trends everybody is imitating. But- now that you put it this way, I feel like I can find a way to do it and be true to the timelessness of it. 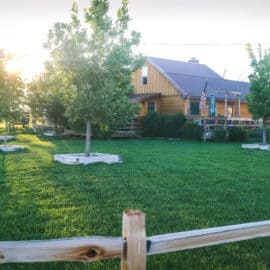 We used to do property maintenance on a vacation home that was a barn from the 1800s that had been turned into a home. It had amazing era-appropriate shiplap, wide, rough and warped planks with uneven gaps. I’m usually a little OCD about that stuff, but because it was the real thing, I LOVED it. Thanks for giving me permission to still do it without being trendy?? Full permission, Lea. 😉 And that barn turned vacation home sounds amazing! 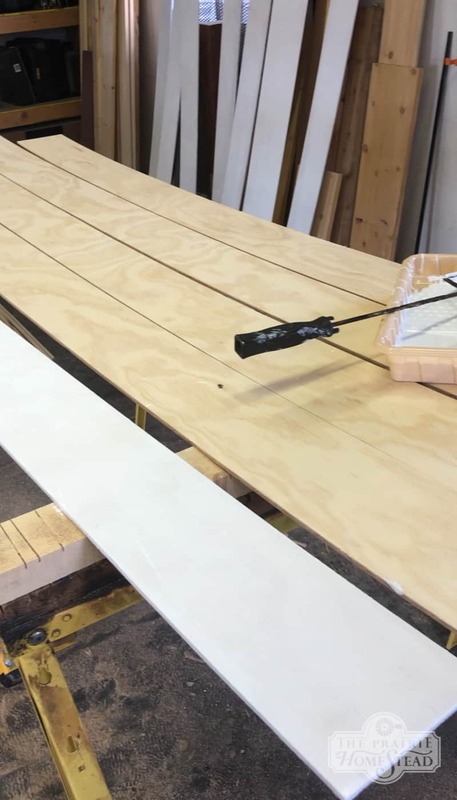 What thickness and what grade or type of plywood did you use? My husband is asking me these questions and so I’m asking you. Your kitchen turned out amazing! We just bought a house with a basement and think this might be just the thing to brighten it up. Thanks so much! It was just 1/4″ smooth plywood that we got from the local building store. I think this would be a great basement option! Jill I think the Shiplap looks great. Beautiful! On paint – they do make a plasticezed paint that is awesome for kitchen applications. Everything wipes right off! 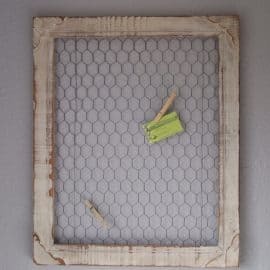 Ah, now that would be an awesome choice for painting shiplap backsplash! What are your countertops. I really like them! 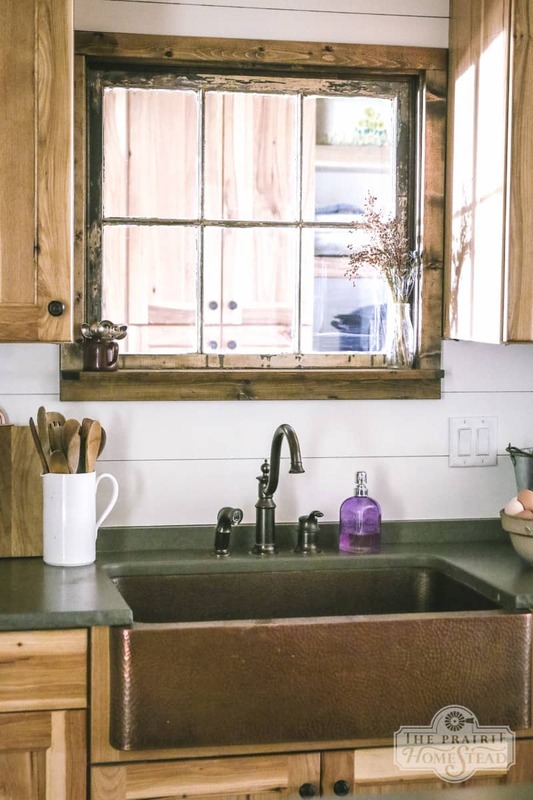 I love, love , love the faucet over the stove! Brilliant! That was the hubs idea. I thought it was dumb at first, but I use it allllll the time! I love it. You’ve done an amazing job. Good design, good execution. 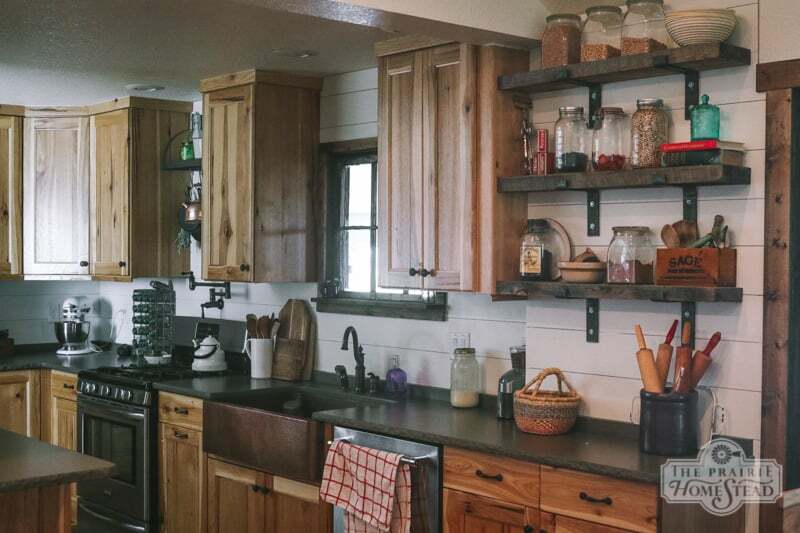 Hi, I too am looking to put shiplap in my kitchen as a backsplash. I was worried about water splashing on the boards behind my sink do you find that to be a problem? Also did you miter the corners or but them up to easchother? Thank you so much! What did you do for the stove vent? 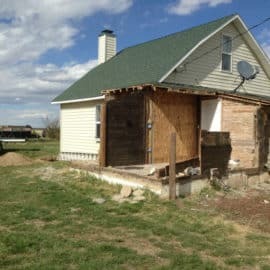 I am at this stage in my remodel and would appreciate any info you can pass my way. 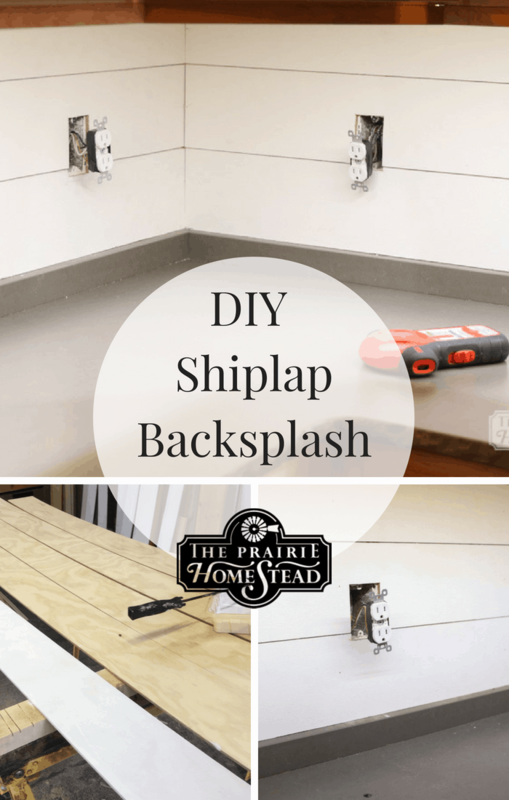 We have put shiplap in our living room and in our bathroom…. just curious how you like it behind your stovetop??? Is it easy to clean???? I guess I just worried that grease would just soak right in but now that I see it in your kitchen I want it in mine when we remodel. I love this! Did you do anything special to make the gaps between the boards? Did you use an spacers? I love the gaps so I want to make sure I do it correctly to get this look. Hi, We are looking to do Ship Lap in the kitchen. We are worried about the moisture and any water damage against the wood. Have you had any problems with warping? Mildew? Love to get some feedback. The shiplap looks amazing! We are about to do the same thing. I have the same questions as Diana above. 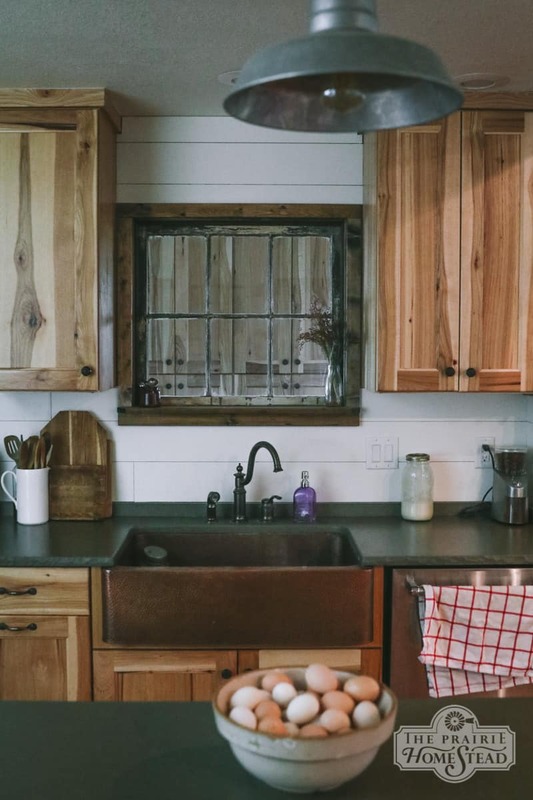 How do you feel about the shiplap now that you’ve had it a while? How did it compare to do it this way rather than tile? Thank you! !